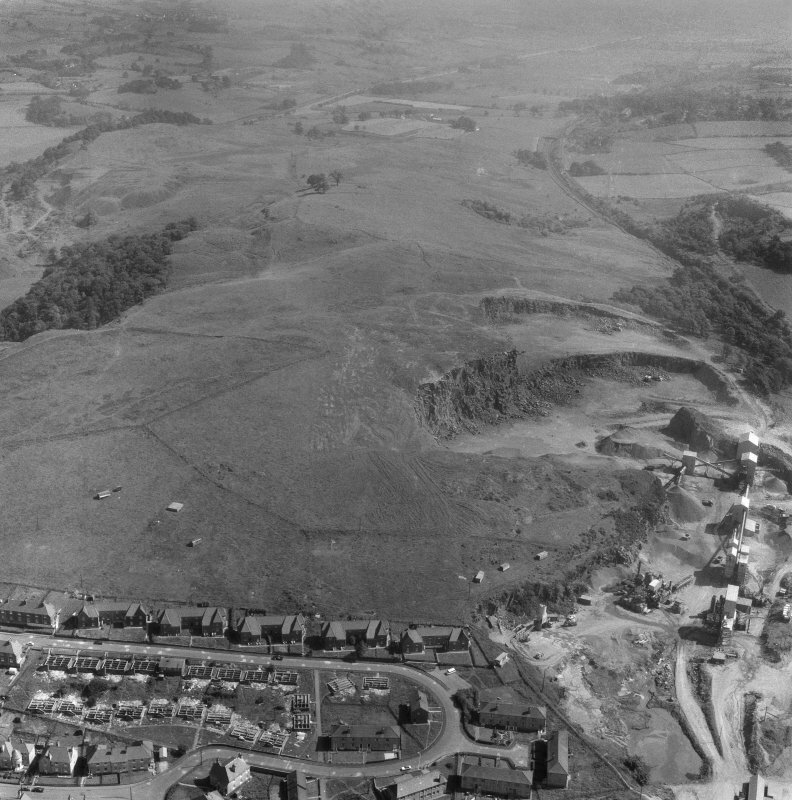 Excavation photograph of the Antonine Wall at Croy Hill Roman Fort. 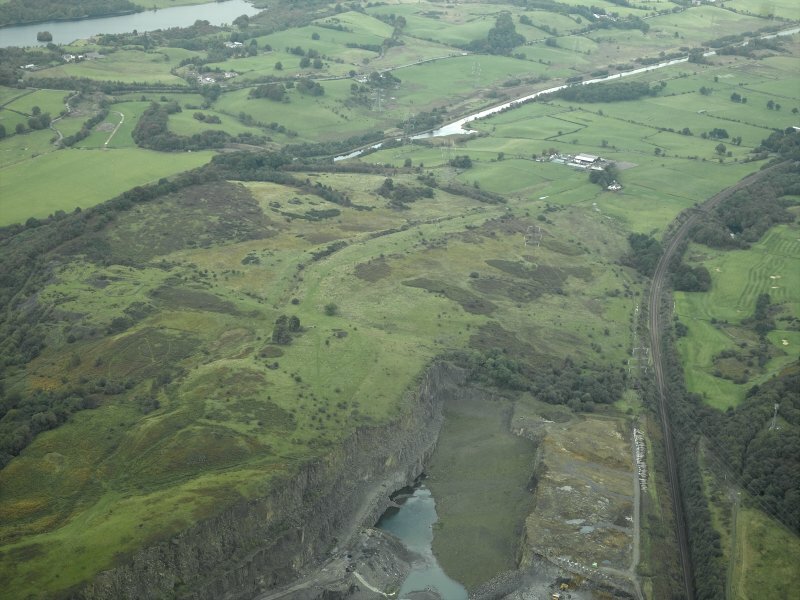 General oblique aerial view centred on the site of the Roman fort and the course of the Antonine Wall with the canal basin and site of the possible Roman fortlet adjacent, taken from the W.
NW oblique aerial view of Antonine Wall at Croy Hill Roman Fort. 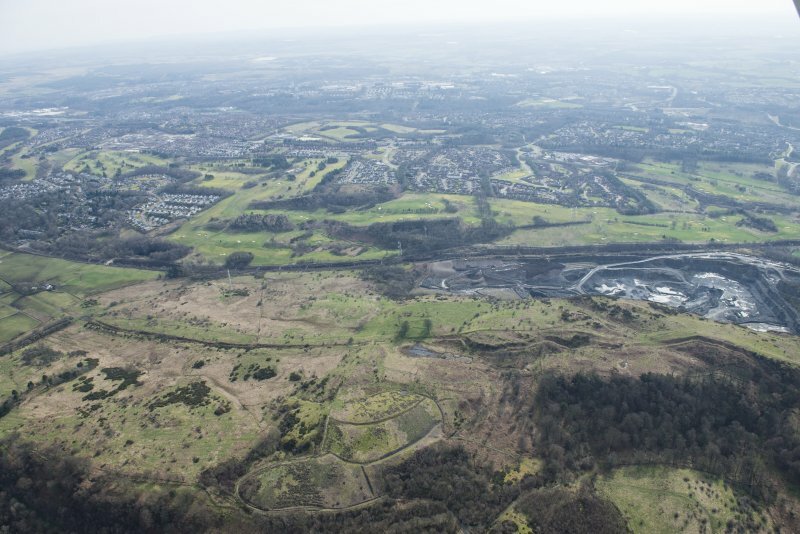 General oblique aerial view centred on the site of the Roman fort and the course of the Antonine Wall, taken from the WNW. 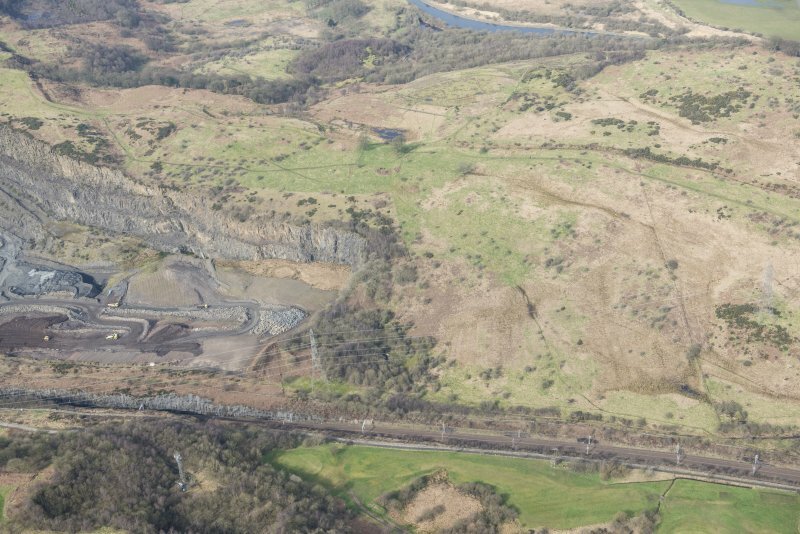 General oblique aerial view centred on the site of the Roman fort and the course of the Antonine Wall with the quarry and canal basin adjacent, taken from the S.
The site of Croy Hill Roman fort occupies the larger half of a plateau on the E side of the hill. The 18th century historians stated that traces of the fort were either very indistinct or totally levelled. In their time, a hamlet was flourishing there, adding to the destruction of the fort. The ruins of a farmstead and a few trees now occupy the site. 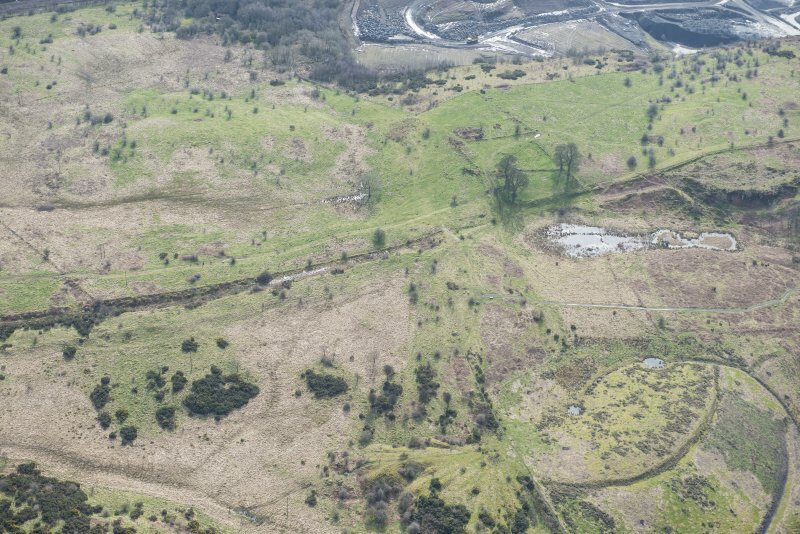 Roman stones have long been recorded from Croy Hill, including many building stones tooled with diamond and other patterns, noted by the Glasgow Archeol Soc's Antonine Wall Committee when cutting sections across the Wall and Ditch on Croy Hill. Excavations by Sir George Macdonald in 1920, 1931 and 1935 have recovered much of the plan of the fort. Internally it measured 243ft from E to W by 270ft, enclosing an area of 1 1/2 acres. 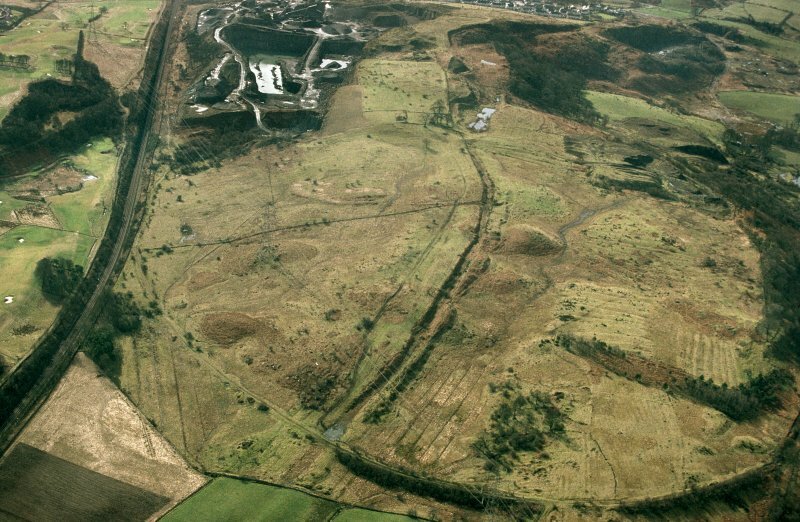 It abutted the Antonine Wall on the N, and on the remaining three sides was surrounded by a turf rampart, with three ditches on the W, and two on the S. In the centre of the fort were found the remains of the Headquarters Building and a granary. In the NE corner there was a remarkable stone-built well, later built over by a corner tower. A bath-house stood just outside the NE corner. Evidence for alterations and modifications was noted in certain of the fort buildings. 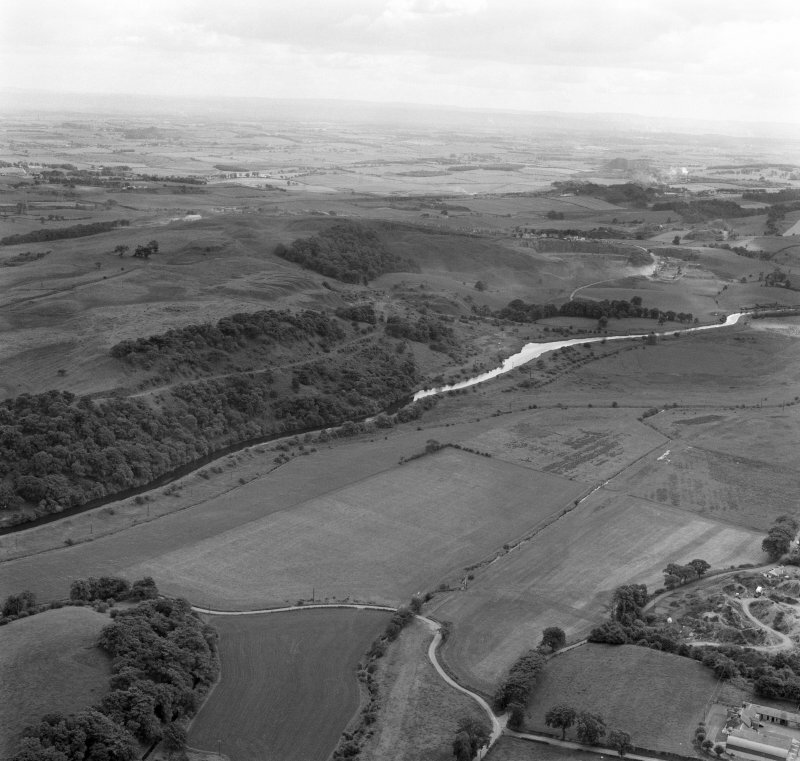 Under the Antonine fort, there was found a trench delimiting a fortlet, enclosing an area of about 3/4 acre with an annexe to the S of it, of roughly the same area. 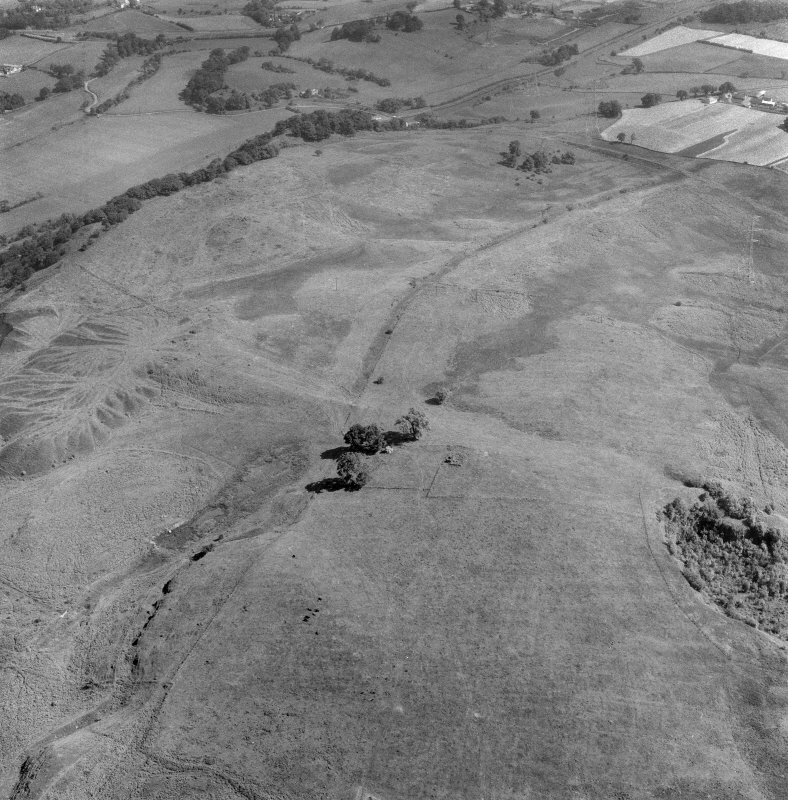 A Flavian date is suggested for the fortlet (A S Robertson, M Scott and L Keppie 1975), which is comparable with that a Bar Hill (NS77NW 8). 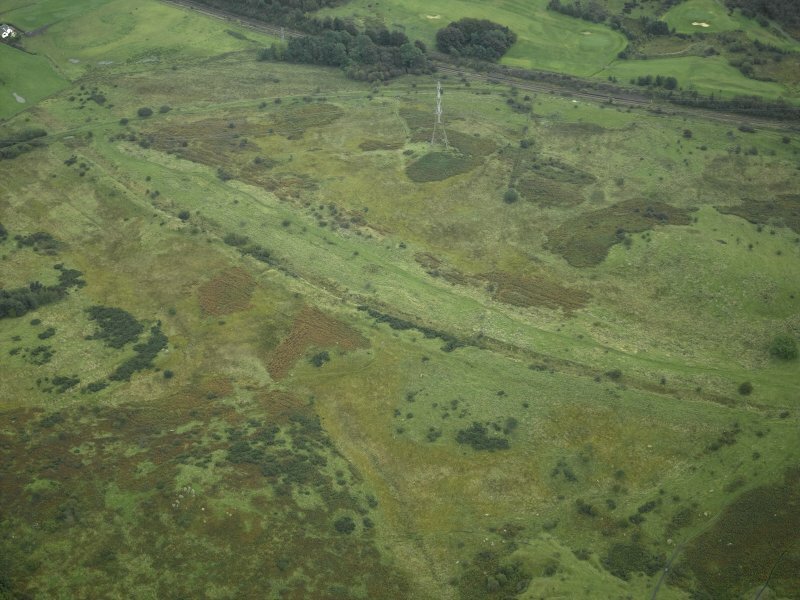 However, preliminary excavation in 1975 discovered Antonine coarse pottery in the silting of the ditches of this fortlet, confirming doubts regarding the early dating. 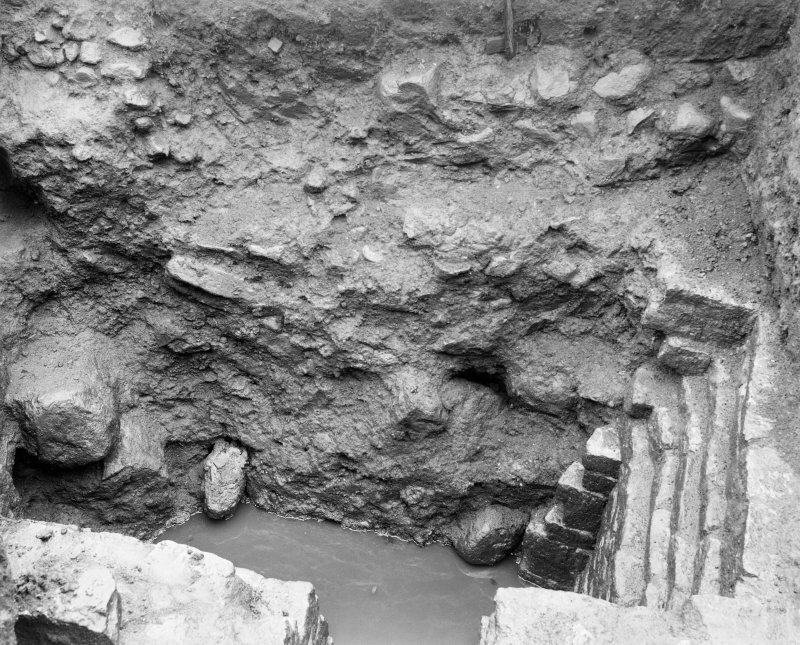 Excavation is to continue for a further period (Current Archaeol 1975). The numerous finds from Macdonald's excavations are in the National Museum of Antiquities of Scotland (NMAS). No vestiges of this fort are to be seen. A few small dressed stones can be found in the ruined walls of the farmstead. 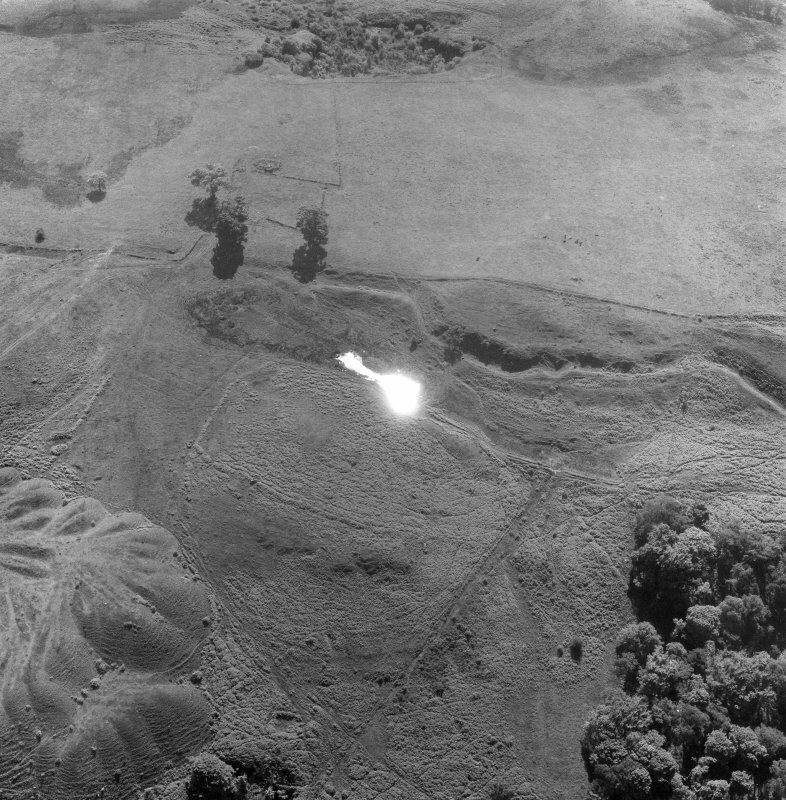 The site is located on high ground in rough pasture. Excavations from 1975-8, in response to renewed quarrying activity in the area, were in areas outside the fort, to the SW, S and E.
The double ditched 'fortlet' found by Macdonald under and to the S of the fort, was found to be a 2nd century construction camp for an actual Wall fortlet discovered on the W side of the fort in 1977 (see NS77NW 29). Indication of a 'vicus' was found on the flat expanse of ground W of the fort and an area of farming allotments or minor industrial activity to the E. A substantial E-W road linked these areas and presumably continued beyond. Further S, another road of unknown association was located. Numerous 2nd century finds include coins of Trajan and Domitian, a possible altar base, a bronze arm purse, fragments of a face mask, and boot nails and pottery. Fragments of 'native' pottery, two beaker sherds and a barbed and tanged arrowhead indicate earlier occupation in the area. A whetstone from SE of the fort is in the NMAS. A full excavation report is pending. The excavations have been backfilled so there is now no no surface evidence of the fort, vicus or allotment areas. 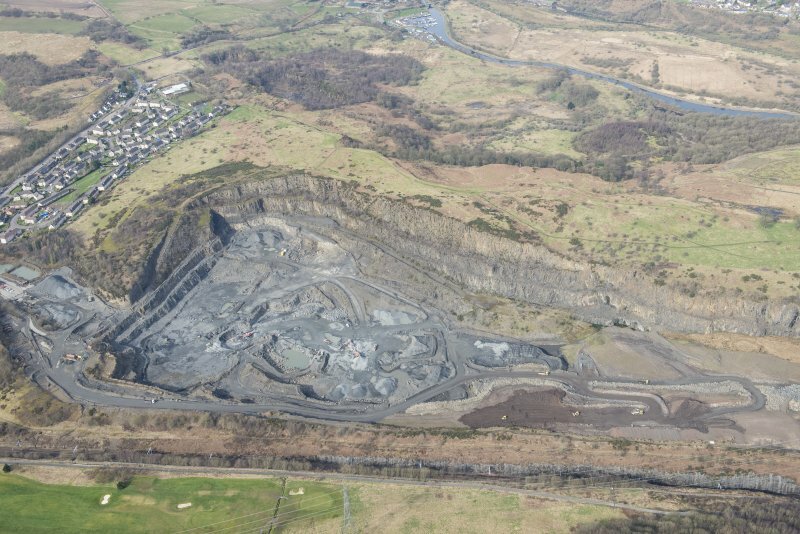 Quarrying has not so far encroached upon the area. Visited by OS (MJF) 2 June 1980. Possible pottery kiln outside fort. NS 7335 7652 Archaeological monitoring was undertaken in July 2000 while minor excavations were carried out in advance of the positioning of a new access gate to the N of the Croy Miners' Social Club. 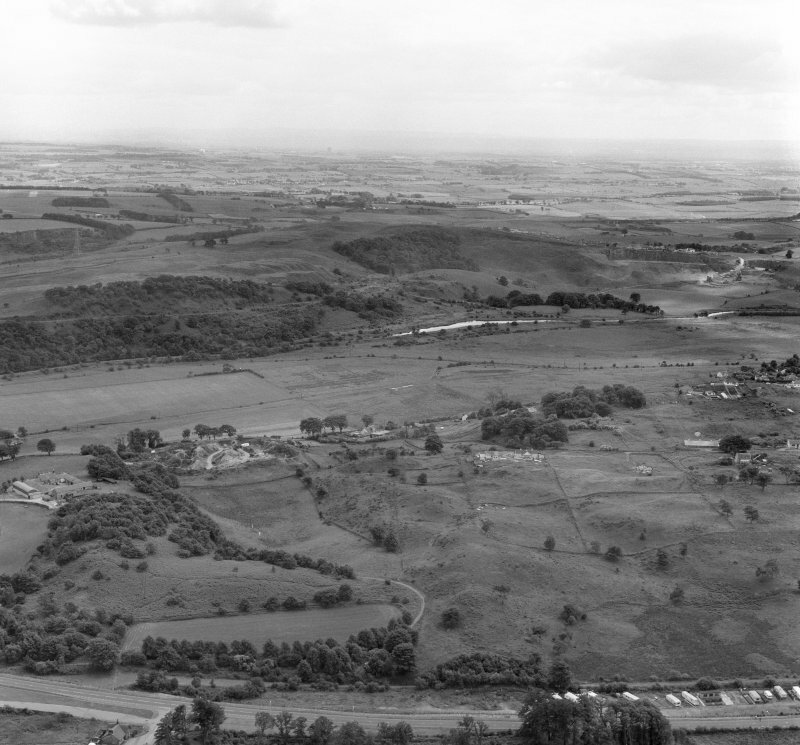 This area is known to lie on the course of the Antonine Wall vallum, with the wall itself running along the N side of the miners' club car park. Three holes up to 400mm deep were machine-excavated for the new gate posts. No archaeological deposits were disturbed, indicating the extent of the modern overburden in this area. This fort occupied one of the highest points on the line, about 120m above sea level. 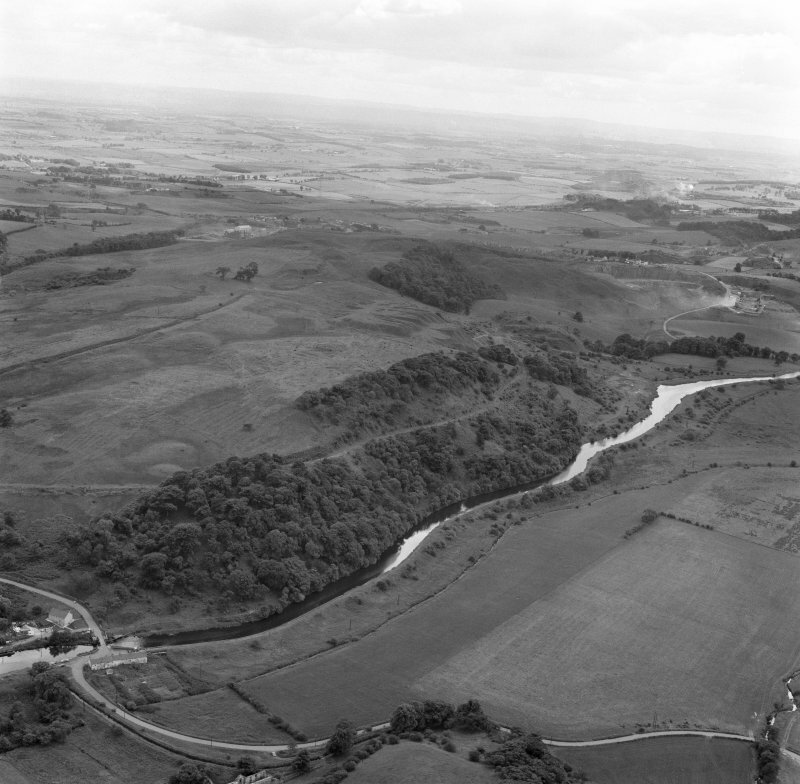 The N gate of the fort was situated at a break in the Antonine Wall (NS77NW 49.00), the base of which, in similar fashion to Westerwood had been laid down first, to a width of 4.3m. The fort rampart base, certainly on the W side, slightly overlapped the base of the Wall. Outside the N gate there was a brief stretch of cobbled road, although no break in the Ditch, 12m wide at this point, was evident. To the E of the fort was a 25m long "Bridge". 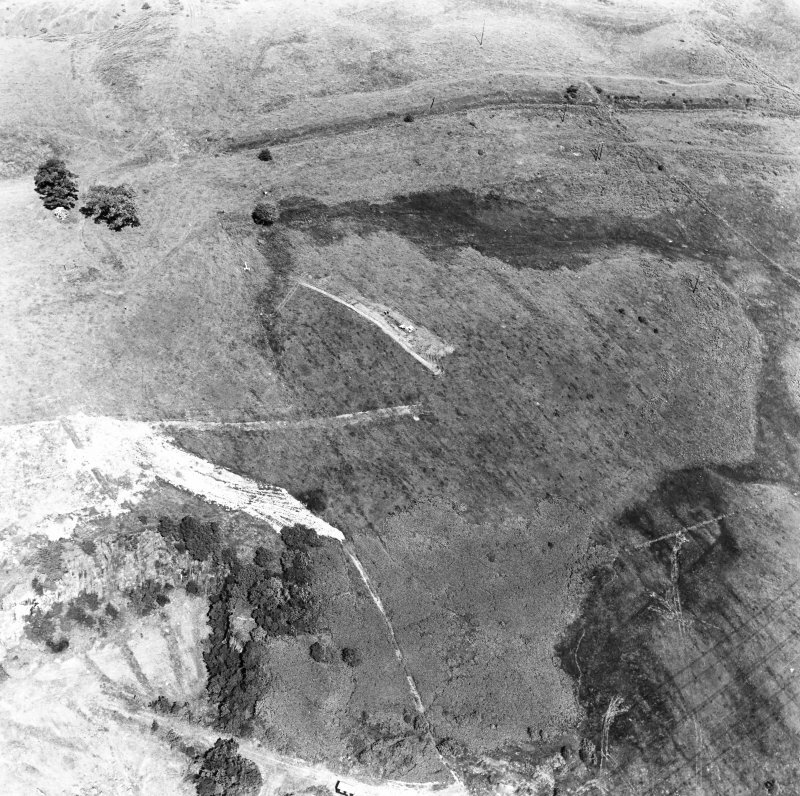 There were two or three ditches along the S and W sides of the fort, but on the N section of the E front there was only one ditch, and there was a total absence of ditches on the S section of that front or the E section of the S front. 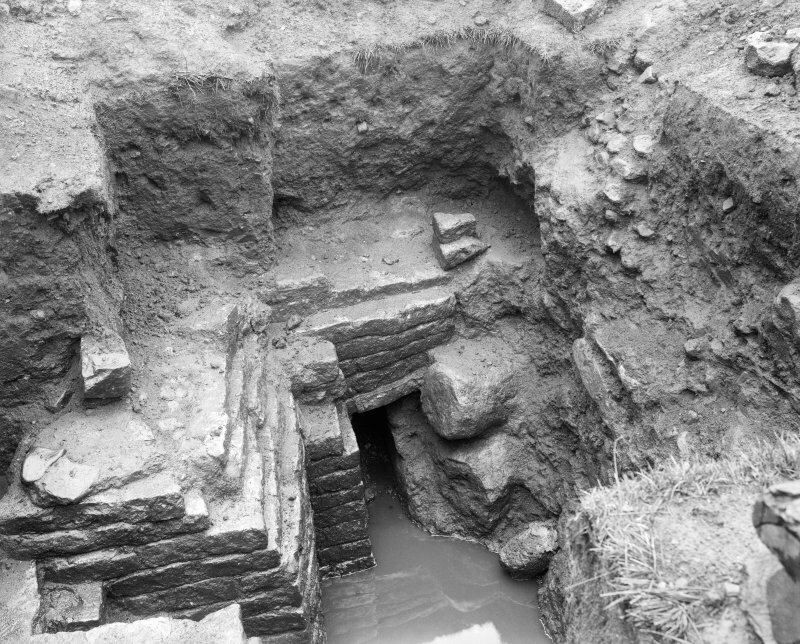 Remains of a stone headquarters building and a granary were discovered in the heart of the fort. A remarkable stone-built well, built over by a corner tower at a later date, was situated in the NE corner, and just outside this corner was a bath-house. Certain of the buildings show evidence of alterations and modifications. Intermittent finds on Croy Hill, including an altar to the Nymphs and characteristic building stones point to the presence of a detachment of the Sixth Legion at the fort. 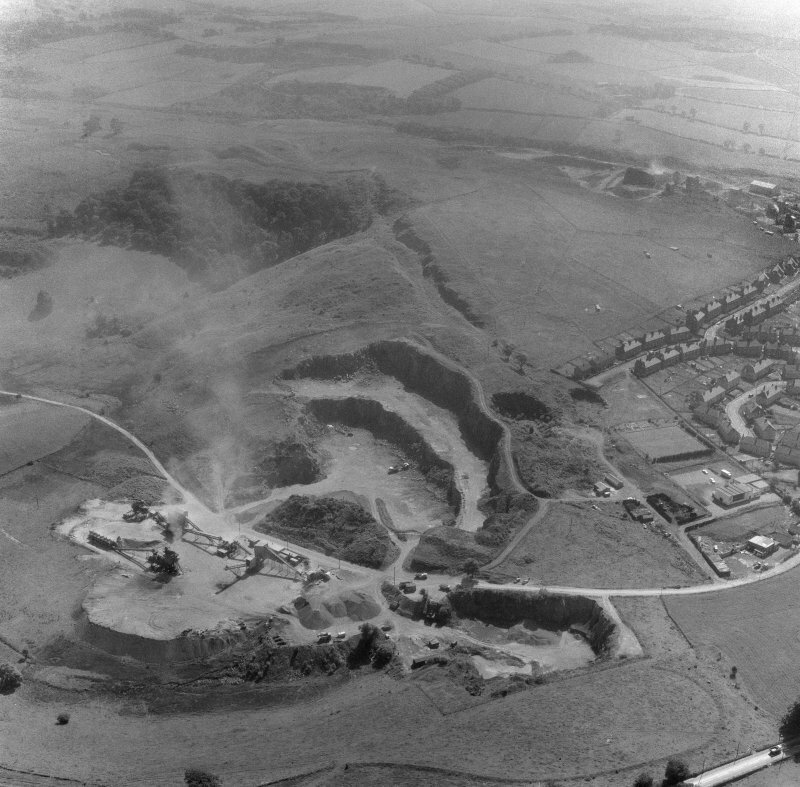 Further excavations were carried out to the S and E of the fort between 1975 and 1978. 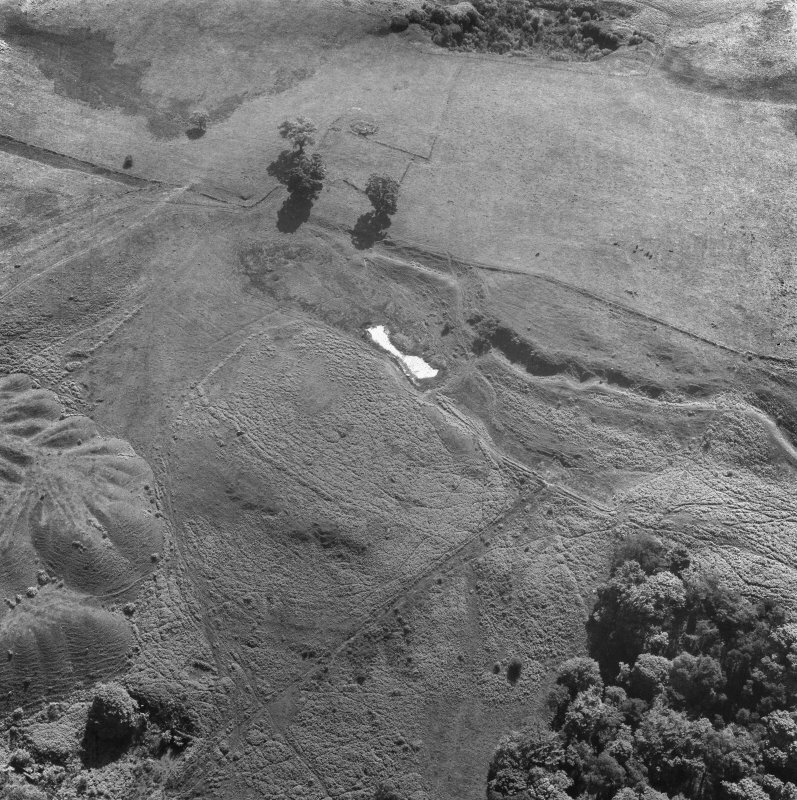 Evidence of a civil settlement was discovered to the SW and on the exposed hillside to the E there were indications of agricultural and industrial activity. There were some small finds, including a storage jar holding cremated human remains and afragmented bronze armpurse. The existence of a bypass road running S of the fort was also determined. George Macdonald had first noted in 1931 a small enclosure of about 0.75 acres, with an attached annexe of equal size to the S of it. However, his dating to the Flavian period has now been revised. 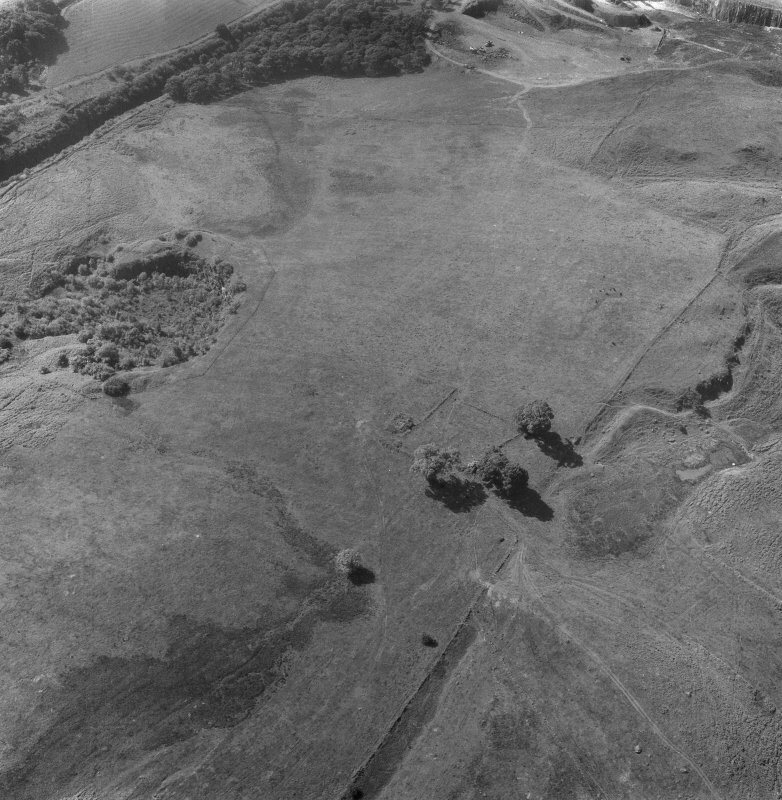 A construction party of the Antonine times seems now to have been the more likely occupants, possibly soldiers building the fortlet (NS77NW 29) discovered in 1977 on a small plateau situated some 80m of the fort on Croy Hill. AS Robertson and L Keppie 2001. NS 723 762 A watching brief was carried out in January and February 2004 during the excavation of a service trench for a new community building. 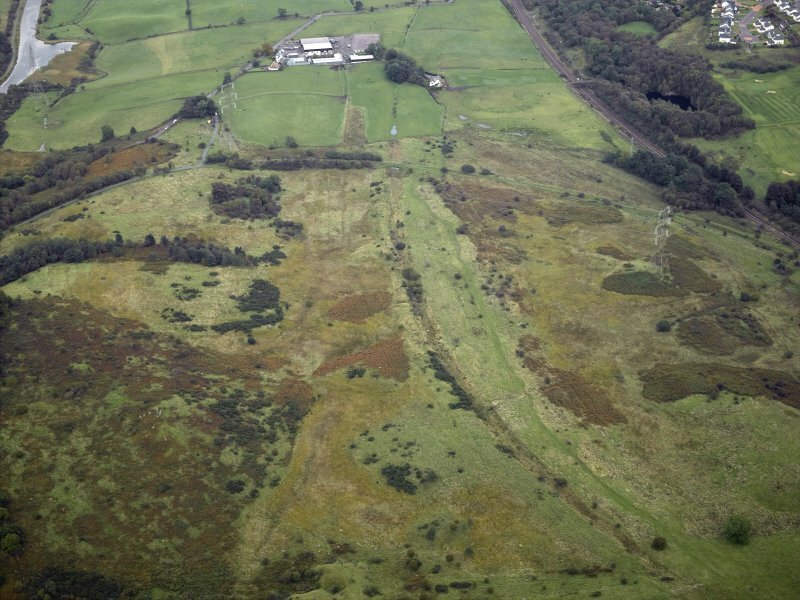 The trench crossed part of the Scheduled area associated with the Antonine Wall (NS77NW 10), the course of which runs immediately N of the new building. A number of large stones set into the subsoil at the base of the trench were interpreted as the possible base of the Antonine Wall. There was no further evidence for the construction of the wall, nor were there any finds from the excavations. Report lodged with WoSAS SMR and the NMRS. 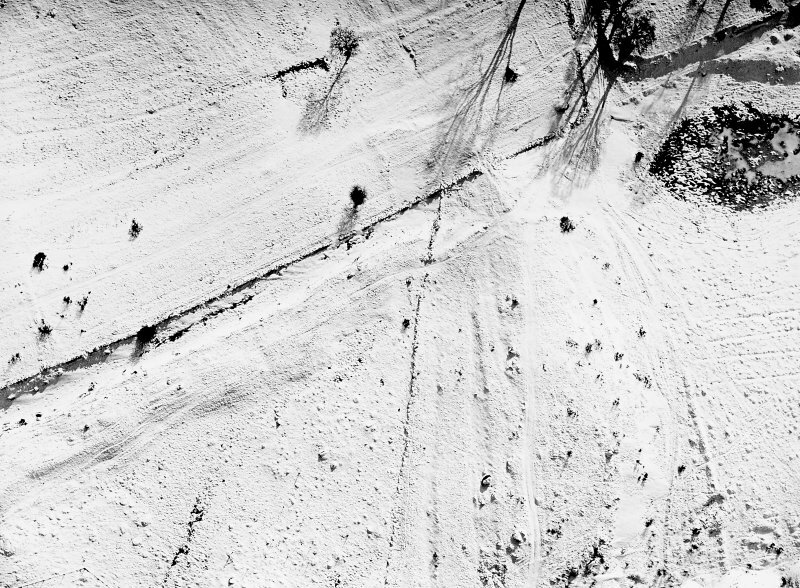 Oblique aerial photographs taken by Mr John Dewar in 1971. 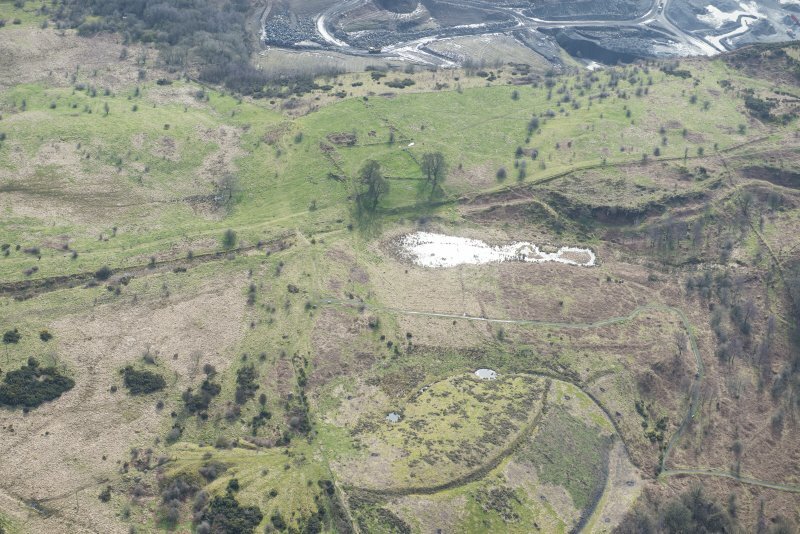 A watching brief, under Kirkdale Archaeology’s call-off contract with Historic Scotland, was provided whilst 5 holes were dug for the positioning of information boards; 4 at Rough Castle, Falkirk District, and 1 on Croy Hill, North Lanarkshire. 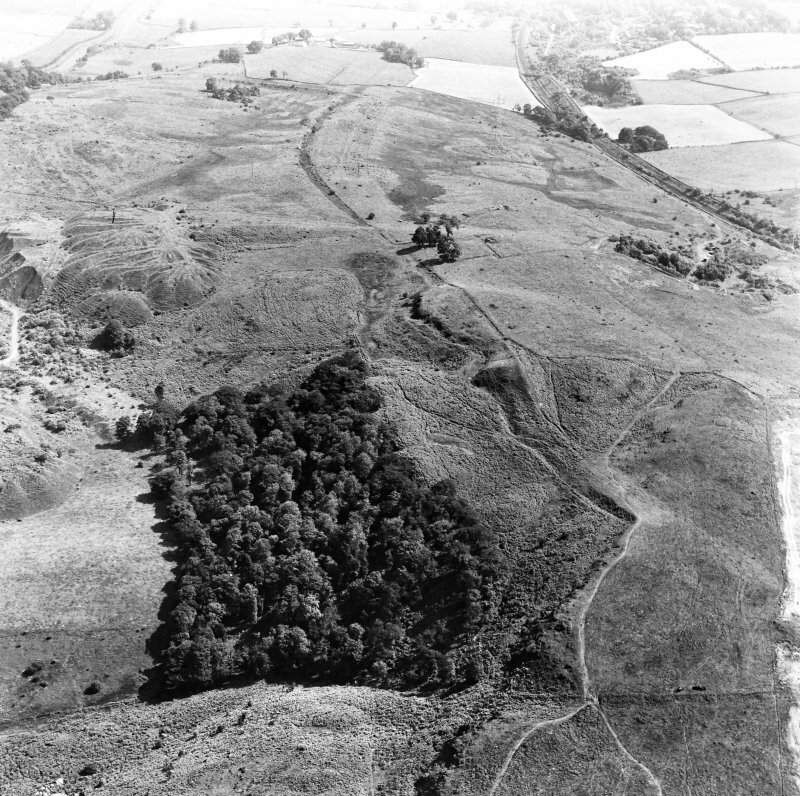 The Rough Castle complex is a splendidly-preserved section of the Antonine Wall with its fine rampart and ditch, traces of the Military Way, 2 signalling platforms and the finest remains of a fort on the Wall, with an annexe and features such as the stake-pits to the NW of the causeway across the Wall. Croy Hill is noteworthy because of another impressive section of the wall and ditch. 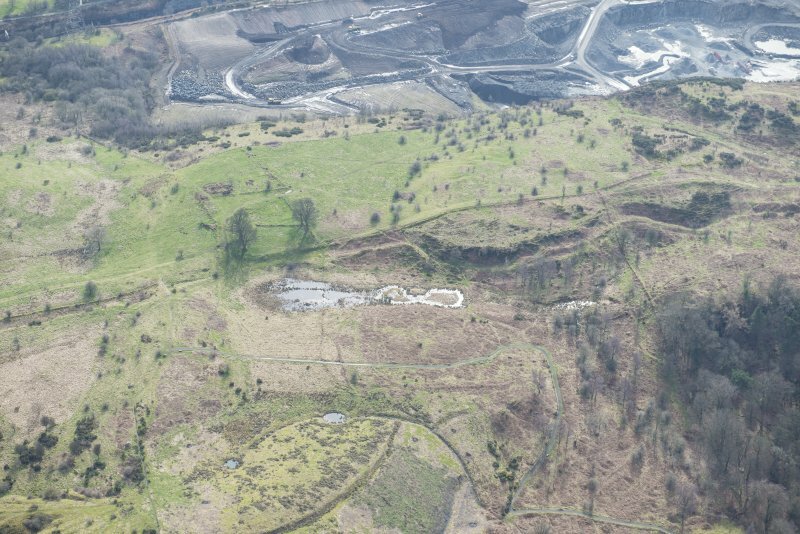 Little of the fort, vicus and fortlet on the hill can now be seen. The holes dug were all rectangular, c 85 x 60 cm in size and 15-20 cm deep. The work, which was carried out on 3.12.96 during heavy rain, sleet and sporadic blizzards, was recorded only by photography (1 frame of monochrome print and 1 of colour slide film was taken of each hole) and notes, since nothing of interest was uncovered. (primarily the outcome of motorbike and horse use). 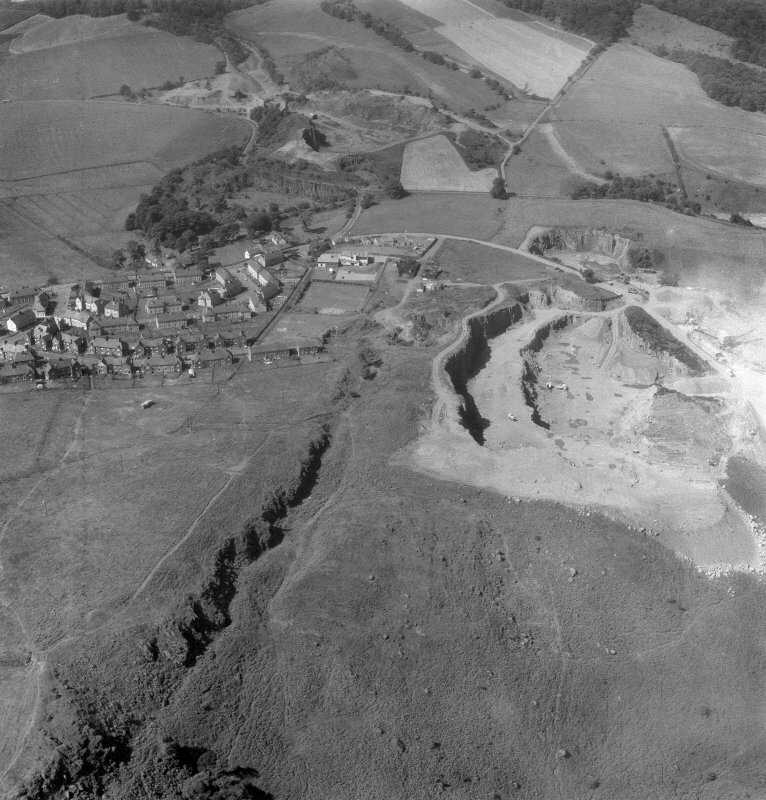 The Roman fort on Croy Hill was first discovered during excavations by Macdonald in 1920, following earlier antiquarian reports. 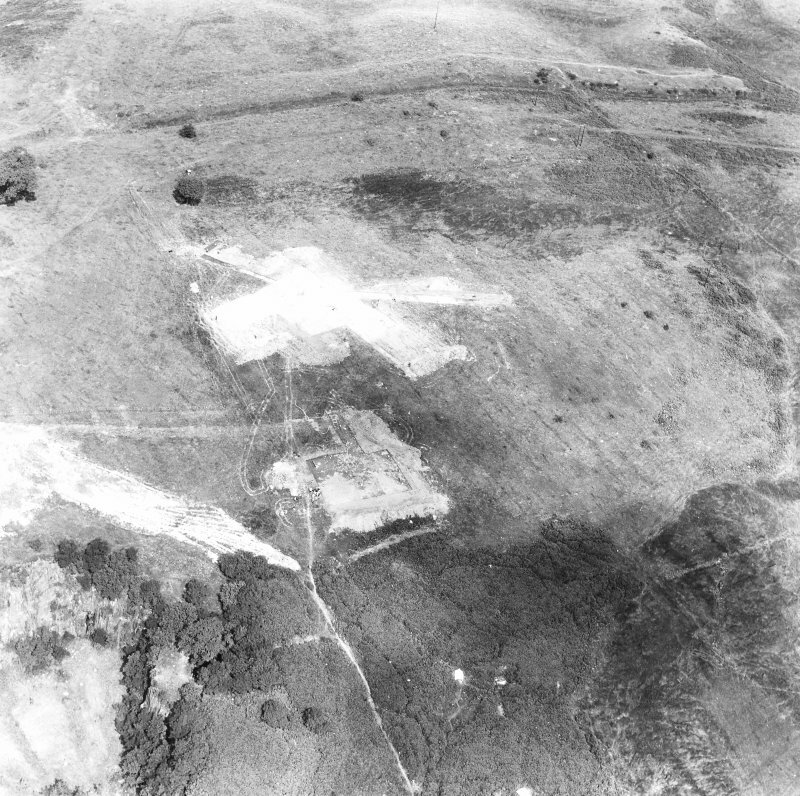 In 1925, Macdonald noted the remains of a ditch that could have belonged to an earlier ‘lay out’ of the fort (Macdonald 1925: 289). 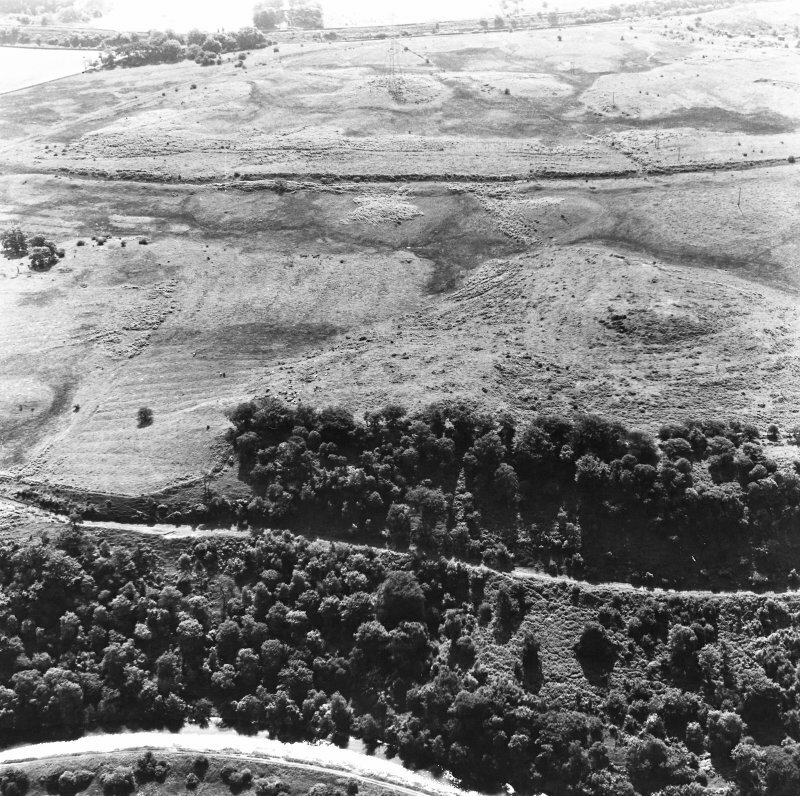 Further excavations in 1931 clarified the plan of the Antonine fort, and discovered an ‘older fort’ lying beneath it, at that stage presumed to be one of the Agricolan praesidia on the isthmus (Macdonald 1934: 267–8). 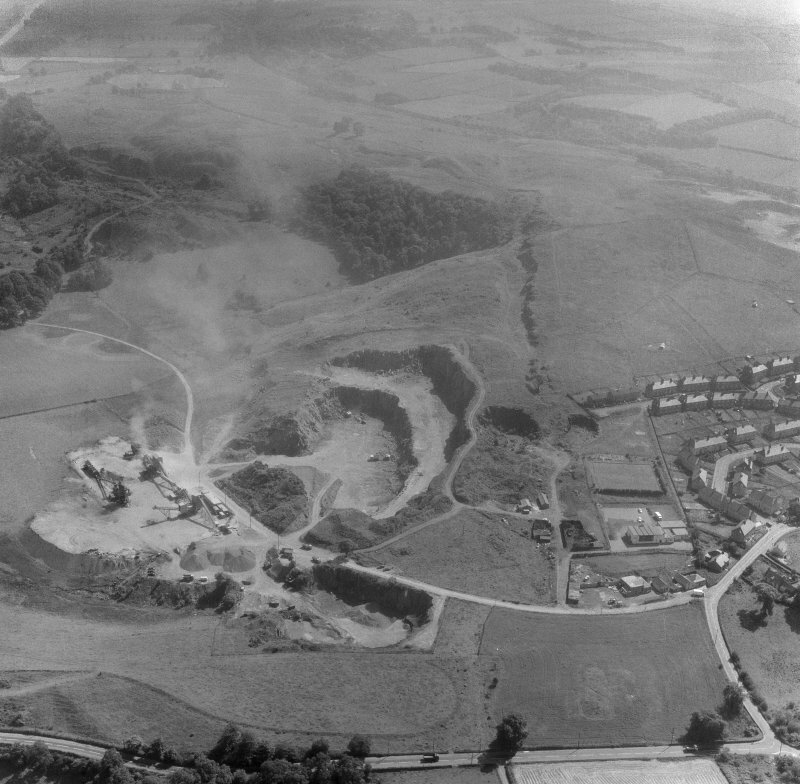 Hanson undertook further excavations on the underlying enclosure in 1975 and 1977. 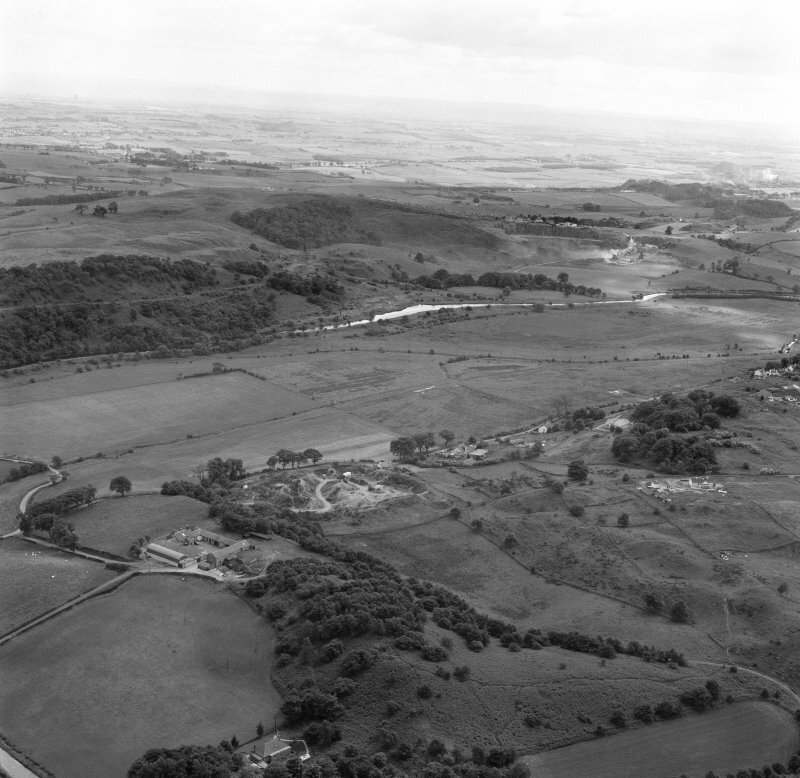 His excavations demonstrated that it was Antonine in date on the basis of pottery found in the ditch, and indeed no evidence for Flavian occupation was found (Goodburn 1976: 302). 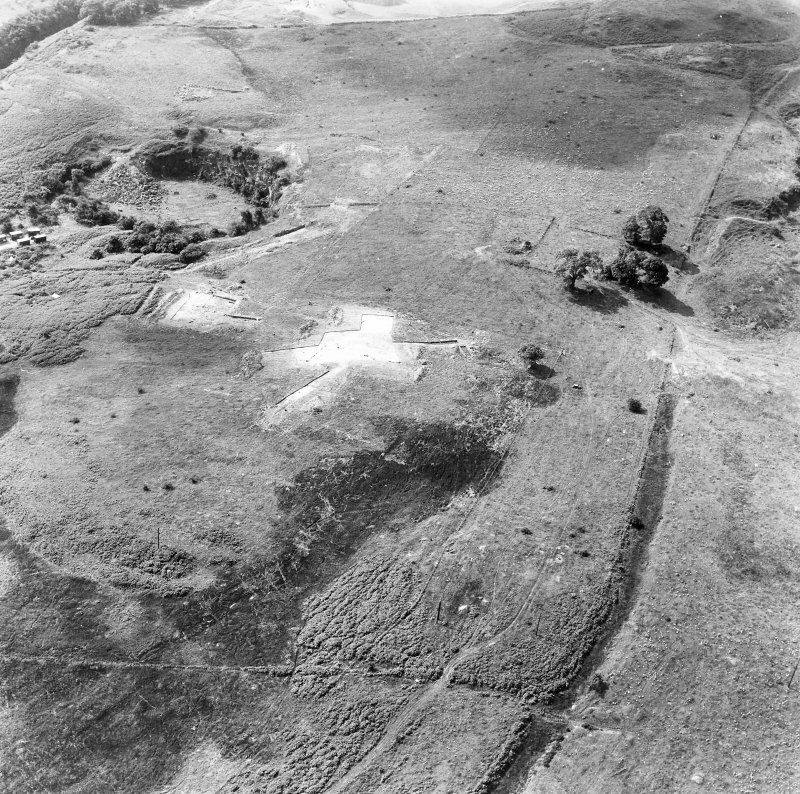 A nearby fortlet, some 100m to the west, was discovered during the 1977 excavations, leading Hanson to suggest that the enclosure underneath the fort was the construction camp for the fortlet (Goodburn 1978: 413–15), while noting that it was considerably smaller than any other presumed construction camp on the Wall (Hanson and Keppie 1978: 93). 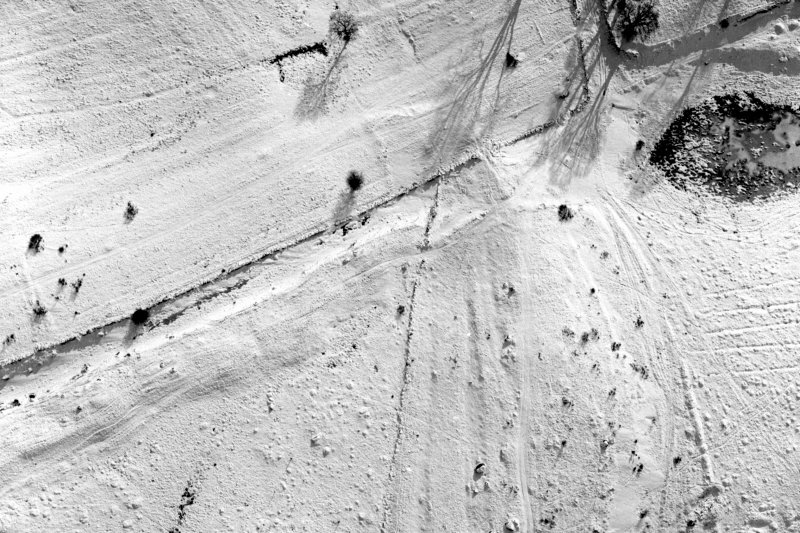 The ditch of this presumed construction camp varied in width from 1m to 2.3m and in depth from 0.3m to 1m. 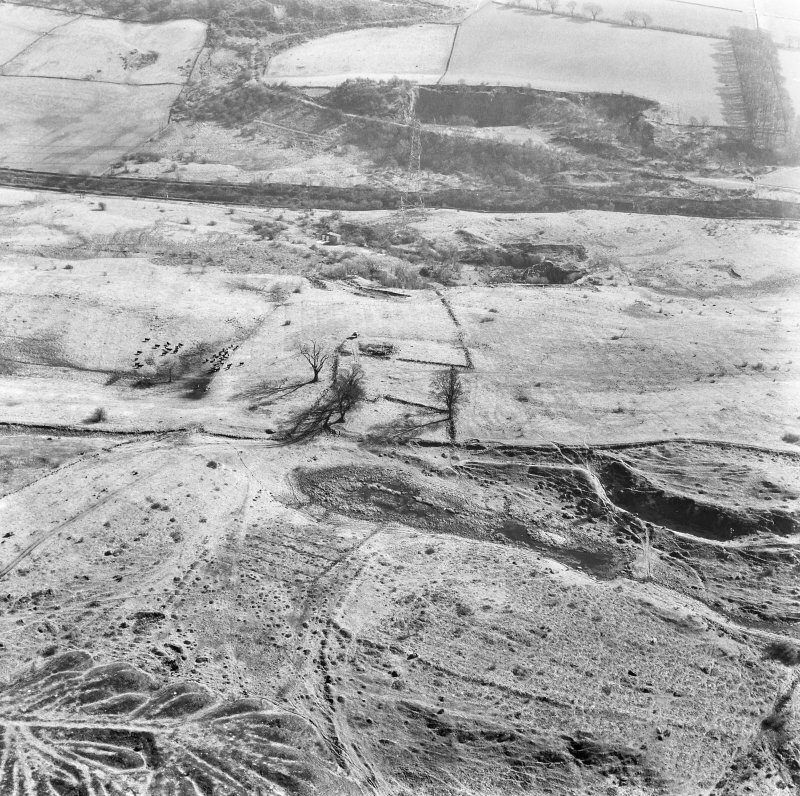 It had apparently lain open for some time before being deliberately backfilled with clay and large stones, attested to where the fort rampart overlay the ditch (Hanson 1977; Hanson 1979: 19). The small ‘drainage’ ditch noted by Macdonald leading southeast from the annexe was recorded as merging with the ditch dug for a Roman road taking traffic around the fort, thereby adding weight to the suggestion of an Antonine date (Hanson 1979: 19). 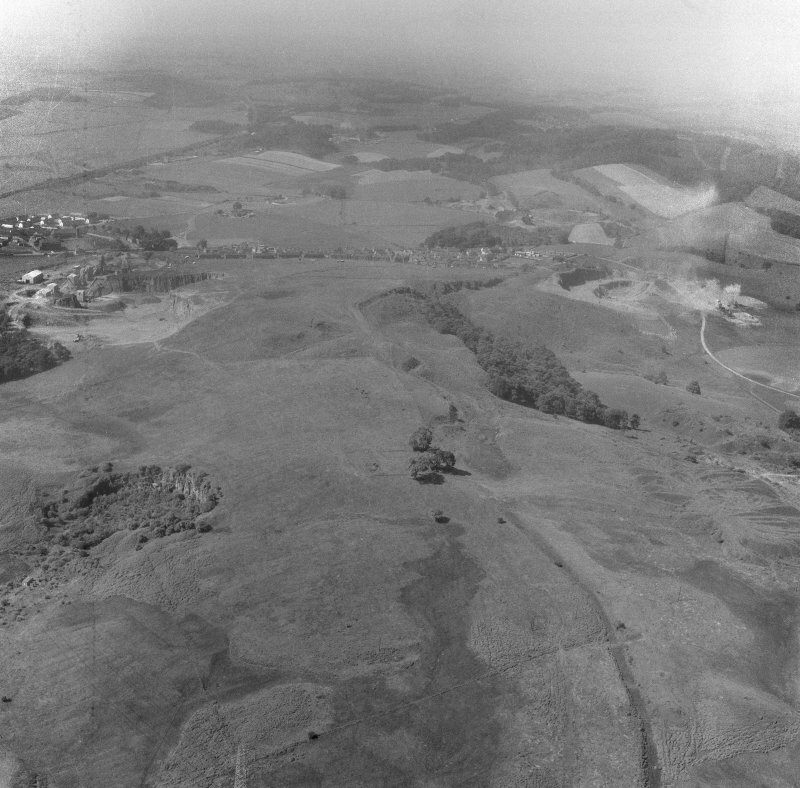 Since the time of its discovery by Macdonald, the enclosure on Croy Hill has been associated with the nearby ‘fortlet’ on Bar Hill (Macdonald 1934: 273) and potentially with other ‘Agricolan praesidia’ on the Forth– Clyde isthmus. 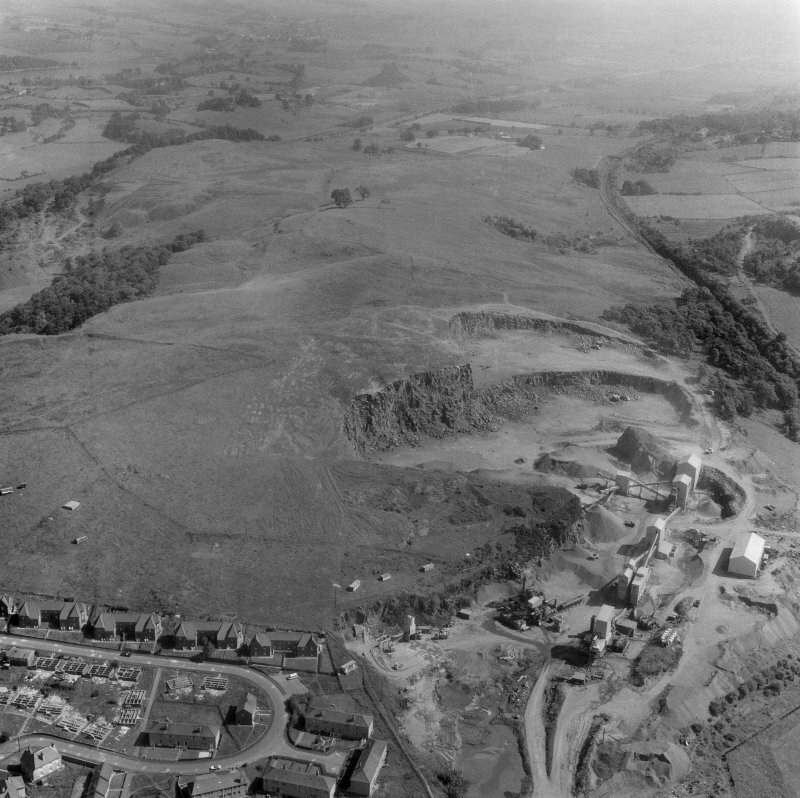 The dating of the enclosure on Croy Hill to the Antonine period has led its neighbour under the fort at Bar Hill to also be associated with the 2nd century ad, prior to the Antonine Wall forts that subsequently occupied both positions (Hanson 1980: 60). 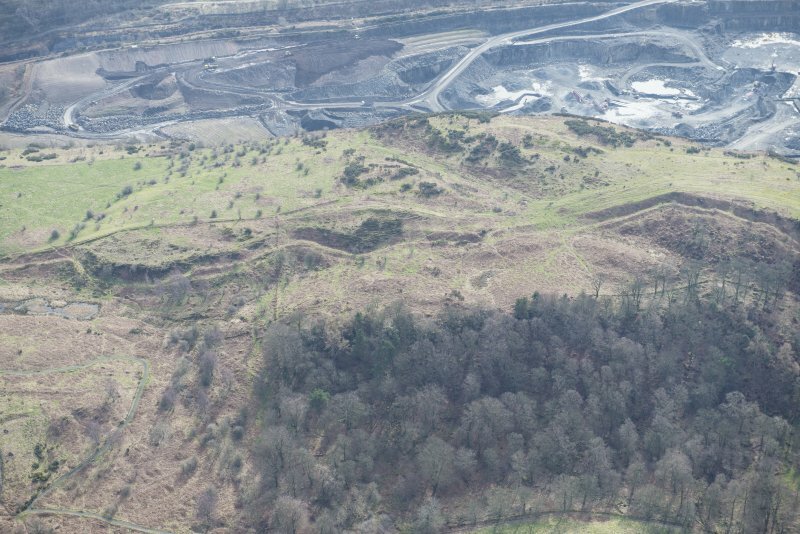 However, as with Bar Hill, this enclosure is located close to the highest point on Croy Hill, with excellent views to the east along the line of the Antonine Wall and west towards Bar Hill. The possibility exists that both could have housed garrisons engaged in surveying the Wall.